The small orange streak in this image from a Japanese weather satellite marks the track of a massive fireball over the Bering Sea last December 18. The image was posted on Monday by Simon Proud, an atmospheric researcher at Oxford University after scientists were alerted to the fireball’s occurrence through archived low frequency sound recordings. 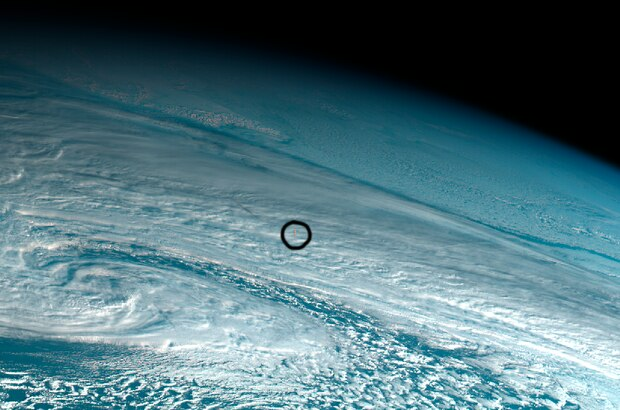 A flying space rock that broke up over the Bering Sea late last year has proved to be the third-largest object known to have struck Earth in recorded history, according to the Canadian researcher who was first to draw public attention to the incident. On March 8, Peter Brown, a professor of astronomy at Western University in London, Ont., was looking through low-frequency sound data gathered automatically by the Comprehensive Nuclear-Test-Ban Treaty Organization when he noticed that an explosive event of unusual force had occurred on Dec. 18, centred on a point about 300 kilometres off the coast of Russia’s Kamchatka Peninsula. Soon after he posted word of his find on Twitter, more information about the event appeared on a NASA website that lists exceptionally bright meteors based on data gleaned from the U.S. Air Force. The data suggest that an incoming object about 10 to 14 metres across – roughly the size of a two-car garage – and weighing about 1,440 metric tonnes, plowed into Earth’s atmosphere at a steep angle and came within 25 kilometres of the ocean surface before it burst apart. The resulting explosion, estimated at 173 kilotons, was more than 10 times larger than the one produced by the atomic bomb dropped on Hiroshima in 1945. “It’s likely that there were very strong shock waves that reached the surface,” said Dr. Brown. He noted that had the object’s orbit intersected with Earth just four hours earlier, it would have exploded over Fort McMurray, Alta., where the force of the high-altitude blast would have been sufficient to shatter windows. That’s exactly what happened in February, 2013, when an even larger object exploded over Chelyabinsk, Russia. Images of the daytime fireball and the damage it produced were widely circulated online. Even larger still, the Tunguska event of 1908 flattened 2,000 square kilometres of forest in a remote part of Siberia. The event is thought to have been caused by an incoming asteroid or small comet about 100 metres across. Looking further back, Earth’s surface is dotted with craters that speak to still bigger and more devastating impacts that have blasted the planet over geologic time, including a massive impact some 66 million years ago that coincided with the disappearance of the dinosaurs. All of this puts last December’s event – now dubbed the Bering Sea airburst – in context as the third-largest on record after Tunguska and Chelyabinsk. Based on estimates of the solar system’s population of asteroids, such an event is expected, on average, about once per decade. That suggests a score of similar sized objects have exploded in the atmosphere over the past couple of centuries, but only recently has technology made it possible to detect those that occur over unpopulated regions, including the ocean. And while too small and too remote to have caused serious damage or injury in this case, it is precisely such objects that scientists are keen to study in order to understand what to expect from a larger airburst, said Lindley Johnson, a planetary scientist with the U.S. space agency, NASA, who holds the rather onerous title of planetary defence officer. By agreement with the U.S. military, Dr. Johnson said he became aware of the December event some weeks ago. The sensitive part of the world (relatively close to both Russia and North Korea) where the Bering Sea airburst took place and the need to make sure it was the result of a natural phenomenon could account for why it took so long for NASA to receive data from the military about the event, he said. He added that the object evaded detection by ground-based telescopes because it approached Earth from the sunward side – an unavoidable blind spot for astronomical surveys that search for nearby small asteroids. “Even if it were a larger object we still would not have seen it in the daytime sky,” Dr. Johnson said. The object’s hidden trajectory left Peter Brown as the only scientist to stumble across the airburst without a tip off from the military. Kelly Fast, program manager for Near-Earth Object Observations at NASA, said that an orbiting observatory would help fill in the gap and allow scientists to spot more objects approaching Earth from a sunward direction. A proposed mission to do so, called NEOCam, could be delayed by cuts in U.S. President Donald Trump’s latest budget request to Congress. In 1994, the U.S. Congress gave NASA the responsibility of identifying and cataloguing all objects that are 140 metres in size or larger in the vicinity of Earth’s orbit by the end of 2020, because the impact of such an object could produce a natural disaster on a regional scale. Dr. Fast estimates the space agency is now about one-third of the way toward that goal and will not reach it by the end of next year. Police report possible meteor landing in Thunder Bay, Ont.